Specialized may not be seen as one of the main players in the cyclocross tire market, but its tires won a national championship under Todd Wells in 2010, and the company boasts four different cyclocross treads (with a fifth on closeout), and offers most of those treads in clincher, 2Bliss Ready, and tubular forms. 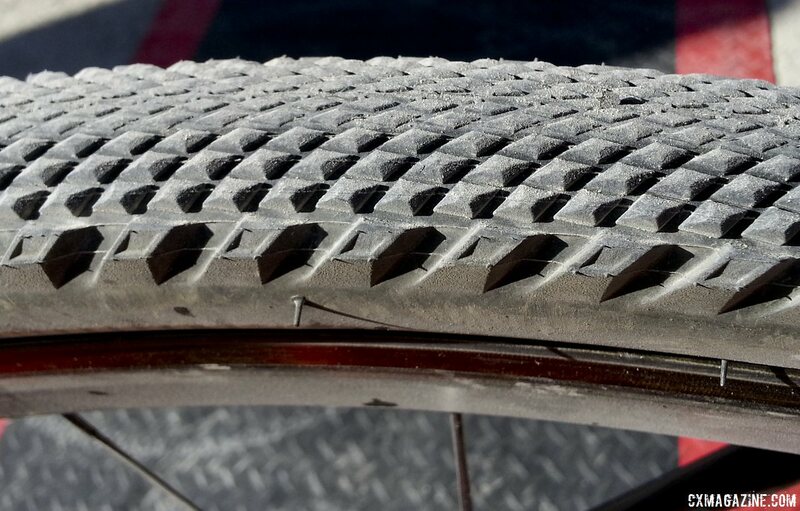 One of those treads is the semi-slick / file tread Trigger, and the company serves up this tread in a UCI compliant 33c width in clincher, 2Bliss and now tubular variations. However, the company also offers the Trigger in the little-known 38c and 42c widths in the form of the wire bead, 60tpi Sport model with BlackBelt puncture protection. The tire isn’t the most race-oriented in terms of weight, as the 38c version of the Trigger Sport, as seen on the 2014 Crux Elite EVO Rival Disc cyclocross bike, tips the scales at a hefty 515g. Now with the growing gravel grinder segment and the shouts for non-UCI compliant cyclocross tires for the masses, Specialized has recognized the need for a lighter, folding version of the higher volume 38c Trigger, and we spotted a prototype of the tire on former Masters Cyclocross National Champion James Alan Coat’s bike prior to the 2014 Lost and Found gravel race this past weekend. At the race (stay tuned for a full report), we grabbed some photos of Coat’s tires and bike. This folding version of the tire was originally developed for Rebecca Rusch for Dirty Kanza a few years ago, but it’s coming to market soon. 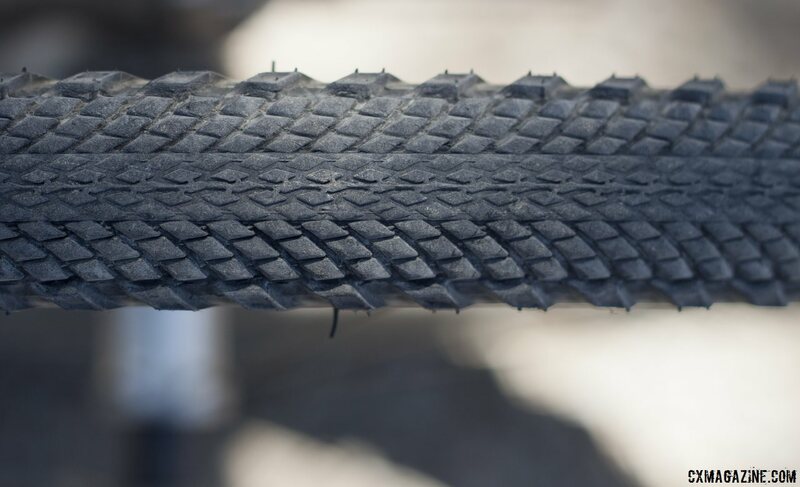 The folding Trigger 38c should offer better pinch flat resistance at lower pressures and lower rolling resistance (by allowing lower pressure) over standard 33c tires for clincher racers, especially for heavier riders, and the tires should fit in a good percentage of cyclocross frames. Since they’re not mud tires, cyclocrossers can push the limits of their frame’s tire and fork clearance without having to worry about room for mud. Coat’s folding Trigger 38c prototypes also feature Specialized’s BlackBelt puncture resistant belt. Specialized’s Sean Estes also has told Cyclocross Magazine that the company will be releasing a 2BR (tubeless ready) version of the 38c Trigger that we’re guessing will fall under the Trigger 2Bliss Pro name. 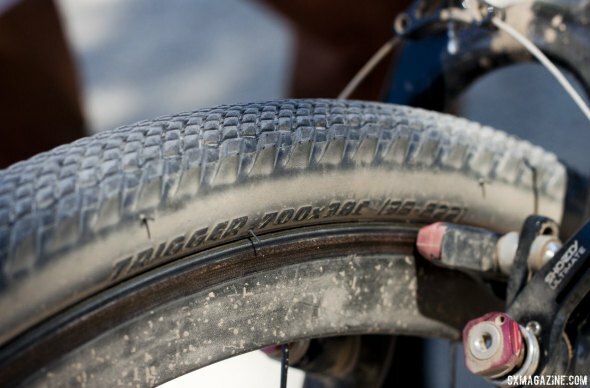 The upcoming 2BR tire will utilize the company’s tubeless-ready casing with butyl-wrapped beads that Estes calls “similar to UST but substantially lighter.” It’s unclear whether Specialized will end up bringing both a 2Bliss Ready and standard folding model (like Coats was riding) to market. The higher volume Trigger represents an alternative to the popular Clement X’plor MSO and USH gravel tires, as well as the new WTB Nano 40c gravel tire , but unlike those options, the Trigger 2BR would be an officially tubeless compatible tire (although we’ve had good luck with the Nano tubeless on NoTubes rims). The 2Bliss Ready Trigger 38c tires should be available later this summer. Stay tuned as we plan to test a set. Big side knobs for cornering traction, with smaller knobs in the center. Specialized plans to bring a 2Bliss version of the 38c Trigger to market shortly. The 38c Trigger prototypes survived the Lost and Found 100, as did Coats. 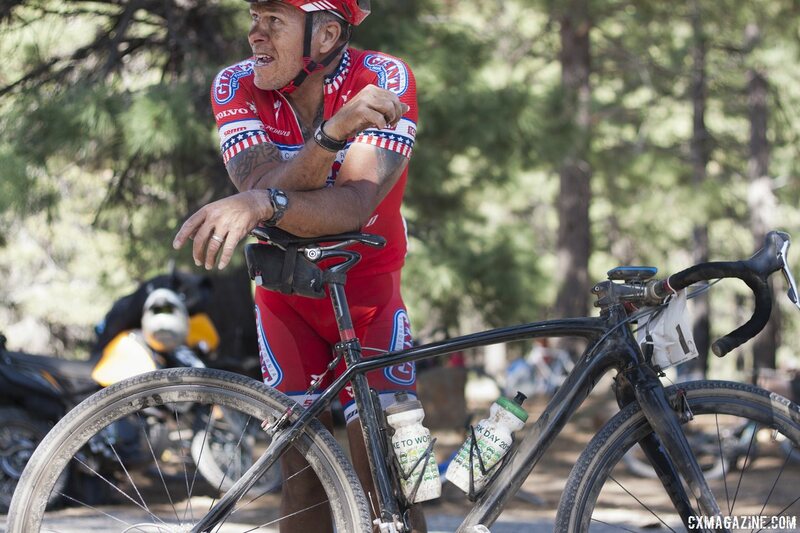 Lots of proto: An old prototype Crux frame and prototype Trigger 38c folding gravel / cx tires. That will be real nice! zenbiking iamspecialized Hoping they get the bead right so folks don’t have blow-offs and can service the tire in the field easily.